Hello and namaste! 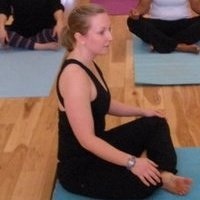 I am so excited to chat with you via Atlanta Yoga Scene. In my new column, “The Road to 500,” I’ll be sharing my experiences as a certified yoga teacher on her path towards completing a 500-hour yoga teacher training (YTT) certification. Ever thought about teaching yoga or deepening your personal practice? If so, I hope this column will help to share some of the intensity and magic of traveling down the yogic path . Before I dive in and tell you all the things I’m learning on this journey, I thought I’d share a little bit about myself and my yoga life thus far. I’m a typical type A, fiery personality (in ayurvedic terms, a Pitta), so naturally, people have recommended I take up yoga to help relax my whole life. When I was 16, I finally took the recommendation and attended my first class at the local YMCA. Everyone else in the room was at least 100 years old in my teenage mind. I could touch my toes, quickly pronounced yoga conquered, and didn’t roll out my mat again until almost 10 years later. I also learned in less than two classes that flexibility is not the ultimate destination of a yogi. Who knew?! A few years and several internal struggles later, I completed a 200 hour YTT through Atlanta Hot Yoga. Now I teach both Hot and Vinyasa classes around town, and, on occasion, I’ve been mistaken for a Kapha (influenced by earth and water rather than fire, according to ayurveda) instead of a Pitta (WOOT!). Nevertheless, my growth isn’t complete; the power and intensity of my first 200-hour YTT left me hungry for more. In this column, I hope to share with you the experience and excitement of completing a yoga teacher training as I pursue my road to 500. Each month, we’ll take a look at a leg of the journey: advanced asana, functional anatomy and the Bhagavad Gita have all been recent rest stops on my path. Next up, mile #1: the power (and pain) of five days of meditation.